Ivor Darreg was born Kenneth Vincent Gerard O'Hara in Portland, Oregon. His father John was editor of a weekly Catholic newspaper and his mother was an artist. Ivor dropped out of school as a teenager because he had a series of illnesses that left him without teeth and with very little energy. He did have energy to learn. He was self-taught in at least ten languages that he read and spoke. He had a basic understanding of all the sciences. His real love was music and electronics. Because of his choice of music, his father cast him out and he and his mother set out on their own with little help from anyone. At that point he took on the name "Ivor", which means "man with bow" (from his cello-playing talents) and "Drareg" (the retrograde inversion of "Gerard"), soon changed to Darreg. Ivor's life with his mother was a huge struggle, and Ivor's health was poor until his mother died in 1972. Part of the reason was that they lived on canned soup, and the salt kept his blood pressure sky-high. Being poor in health and wealth, Ivor became resourceful. He picked up stray wires that were cut off telephone poles and other things on the street and from friends. He said he learned to "pinch a penny so hard, it would say ouch". Ivor created his first instrument, the Electronic Keyboard Oboe, in 1937. Following the current history of electronics and reading from the journals of the day, he learned circuitry. He made the instrument, which still runs today, because the orchestra he was playing in needed an oboe and Ivor took the challenge. The Electronic Keyboard Oboe is not only one of the first synthesizers, but a microtonal one at that. It plays the regular twelve tones, but there are eight buttons that move the tone in gradation from a few cents for a tremolo effect to a full quarter-tone. In the sixties Ivor created an organ with elastic tuning. The circuitry would justify thirds and fifths. In the early sixties, Ivor met Ervin Wilson and Harry Partch. 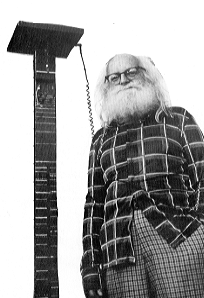 Upon conversing with Wilson and seeing his refretted guitars and metal tubulongs (3/4" electric conduit), Ivor took the plunge into non-quartertone microtonality or Xenharmony. He began refretting guitars and making tubulongs and metallophones in 10, 14, 15, 16, 17, 19, 21, 22, 24, 31 and 34 tone equal temperaments. He shared his new beginning with others through his Xenharmonic Bulletin and other writings. The Xenharmonic Alliance (a network of people interested in alternative tuning systems) was created. When we met Ivor in 1977, through John Chalmers, I saw a need to give Ivor and others a more public forum, so I started the journal Interval/Journal of Music Research and Development. Then in 1981, Johnny Reinhard created the American Microtonal Festival in New York, and in 1984 the 1/1 just intonation group started in San Francisco. Recently the South East Just Intonation Center has been created by Denny Genovese. In the seventies, Ivor created his Megalyra family of instruments, the Megalyra itself being the tour-the-force of Ivor's instrumental creations (featured in EMI vol. II #2). This six to eight foot (1.8 to 2.4 m.) long contrabass slide guitar is strung on both sides to solo (I-I-V-I) and bass (I-V-I) configurations. This instrument sounds like tuned thunder and is waiting for some heavy metal or slide guitar professional to make it a celebrity. Other instruments in the Megalyra family are the Drone, Kosmolyra, and the Hobnailed Newel Post, which is a six by six inch (15 by 15 cm.) beam strung with over seventy strings. Ivor called this instrument his harmonic laboratory. Those of you who knew Ivor or read his writings knew that he had a special outlook on music, and a comprehensive mind that explored many subjects. His compositions, of which all are either on tape or written down, date from 1935. Many of his piano compositions are available on cassette, played by Ivor. From CD notes of DETWELVULATE!